James Beard winning chef Daniela Soto-Innes is known for heading the kitchen at famed restaurant Cosme. Named ‘Restaurant of the Year’ by Eater and receiving 3 stars from the New York Times, the restaurant has proven itself to be one of the best. 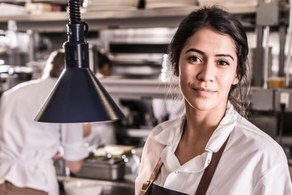 But one thing you may not know about this award-winning chef is that she is only 27... and she won her James Beard at 25. Her secret: Daniela began working in kitchens at 14– lying about her age until she helped open Cosme at 23. I started in a real kitchen when I was 14. The whole time I’ve lied about my age, until I got to Cosme — and then I only lied for the first three months. I quickly realized it’s an advantage to be young in such a high position; it pushes people to be better. My sous-chefs are older than me, all of them, but some of the cooks are younger. We are all treated with respect. They call me “chef.” I know what I’m capable of, not in terms of age but with the experience I’ve been through. The way I manage is, I get them to focus not on how young I am but how much I’ve learned and how much I can give to them. I try to be humble, because they can see right through me. They know when I don’t know. They get people in the door of the restaurant. It’s a magnet for talent — people are excited to eat here, and to work here. Personally, if you can go back to the tape of the James Beard awards, I was so shy. I had nothing prepared. I didn’t campaign for this, it just happened. Now we have expectations, and that’s the stress. We are competing with restaurants that have been around 30 years. I do it for the cooks. I want them to be happy to work here. How do I keep my cooks happy and motivated? Everyone keeps their James Beard awards at the bar, or near the door of the restaurant, but mine is at home with my books. Read more about Daniela’s life as a young boss at The Cut.